wanderlust ATLANTA: Garden Lights, Holiday Nights...Even Better! Garden Lights, Holiday Nights was a resounding success in its 2011 inaugural year and it's poised to be even more successful this year. Already, thousands have visited the Atlanta Botanical Garden to see the expansions of the exhibition or to enjoy the magic of the lights for the first time. The Atlanta Botanical Garden has done great things under the leadership of Executive Director Mary Pat Matheson, who we call "Mary Pat". From the 2004 Chihuly exhibition which bought record attendance, to the opening of the Hardin Visitor Center, the Edible Garden, and the Canopy Walk, we can expect to see the Garden grow and expand in great glory under Mary Pat's direction. What's coming up next year will amaze you...I promise! 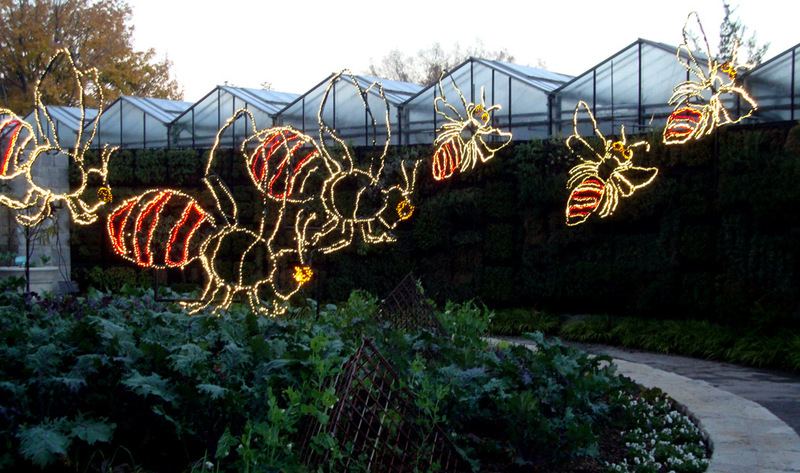 This year brings another half million lights radiating the Garden with a grand total of 1.5 million. And there are new color schemes—noticed and mentioned to me by a visitor recently. 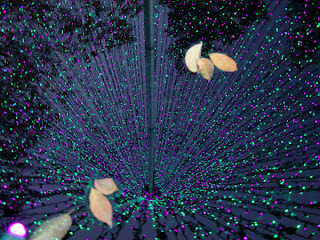 And there new trees with new kinds of lights. And more trees are lit and lit higher than before. The Orchestral Orbs on the Great Lawn dance to some new music and new color configurations. The S'mores pits are back (buy your kits at the bars); the roving carolers have returned (singing beautifully! ); and there are new traffic patterns to facilitate an enhanced experience of all the lights. The Giant Poinsettia Tree—made of 500 Poinsettia plants—is back with a few new plants at its base. This year, on the 'new' list, "Lumina" has joined the Garden's cast. She's a living winter persona there to engage children (children of all ages, it turns out...I even had my photo made with her). There are new fountains in the Cascades Garden, and the Bear Family in the Orchid Center has returned with a newly adopted puppy! For the adults, the bar in the Outdoor Kitchen, in the Edible Garden, at 8:00 p.m. transforms into "Glo Bar"...and night club scene that's perfect for Date Night! 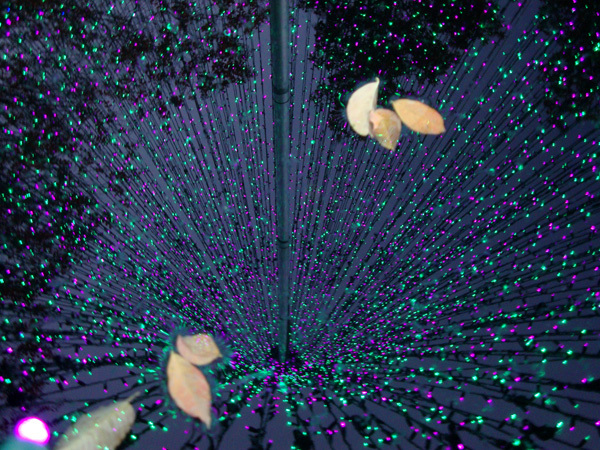 There's a lot more to see and do at Garden Lights...you'll have to come and see for yourself. If you're on a tight budget, may I suggest attending on one of the non-peak nights (Monday, Tuesday, Wednesday), but know that the exhibition is open EVERY NIGHT, holidays included, through Saturday, January 5, 2013. 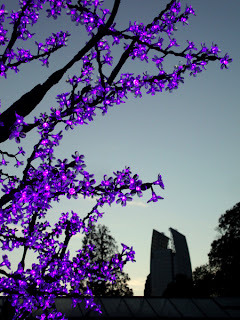 Head over to the wanderlust ATLANTA Facebook Page where you'll find more photos of Garden Lights, which I'll continue to add to for the duration of the exhibition, just be sure to see it in person...photos just don't do the experience justice. 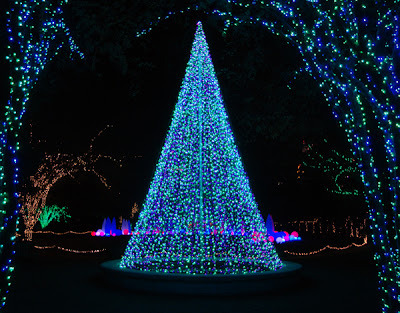 Garden Lights, Holiday Nights is a wonderful event for adults and children! Be sure to grab your tickets in advance, as this event often sells out. Tickets can easily be purchased online: https://tickets.atlantabotanicalgarden.org/ or call 1-855-GLHN-TIX. Happy Holidays!